…I endured the punishment too! Not fully understanding the political background that gave rise to this novel, I found myself struggling to understand to what end he wrote it. From what I can tell, it’s a reaction to the contemporary state of Russian life and philosophy. For that, I guess it works well. It’s hard to say from this end of history. Solzhenitsyn’s novels are, for me, much more powerful. In Crime, all the characters are reactionaries. No one seems to be sane at all. It’s very impressionist. I got tired of the characters all having nervous breakdowns, committing suicide and generally going on a bender every time someone mentioned the weather. I take this to reflect Dostoevsky’s doubt that society (represented by characters from various aspects of life in St. Petersburg: Luzhin, politics; Porfiry, law; Razumihin; education, etc etc…) had any redeemable ideas worth listening to. As for the plot, well it works… to an extent. But some characters seem to be brought in needlessly. Why Svidrigailov needs to be there at all, I can’t fathom. He adds nothing to the story. Neither does Katerina Ivanonva either. I kept thinking they would but they didn’t. I focussed instead on Raskolnikov tormented by a crime. I’m almost certain that the crime itself is not as obvious as the book makes out. 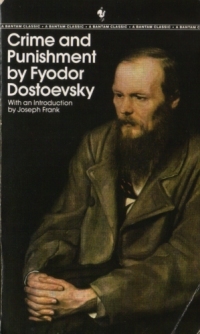 On reflection, I think the crime, for Dostoevsky, is Raskolnikov’s subscription to humanist ideologies with the concomitant punishment being madness. As the book nears its end, deliverance looms large in the form, not of an alternative humanist philosophy but a moral path that leads, a la Pilgrim’s Progress, to the cross. One passage that moved me and stood out in the centre of the book heralded this final conclusion. Raskolnikov forces Sonia to read the raising of Lazurus episode from John 11. It’s a desperate moment for him and one which I can relate to, especially when seen in the light of his eventual epiphany right at the end of the book; one of the best pieces of literature from that generation for sure. On an exceptionally hot evening early in July, a young man came out of the garret in which he lodged in S. Place and walked slowly, as though in hesitation, towards K. Bridge. Man grows used to everything, the scoundrel! Nothing in the world is harder than speaking the truth, and nothing easier than flattery. If you are convinced that one mustn’t listen at doors, but one may murder old women at one’s pleasure, then you’d better be off to America and make haste. If you’ve got Google Earth installed on your pc, you can actually see the locations mentioned in this book by downloading Arukiyomi’s Google Earth – Crime & Punishment file. I enjoyed this book when I read it in high school. I later read The Brothers Karamazov and did not like it nearly as much. I’m not sure if it was because my mindset was different, or if Crime and Punishment was just a much better book for me. I think maybe sometime I should re-read this. I’ve had this one my wishlist for a while, but haven’t gotten to it yet. @ Matt… uh oh… I want to read the Brothers. Hope it isn’t too much of a slog then! I have been eyeing a pretty trade paperback edition of this book for the last couple of weeks at the used book store. I, too, see this book as one man’s journey to redemption. I was amazed when I read it for the first time this winter, that the crime is over in the first third of the book, or earlier, and the rest seemed to drag for me. Normally, I adore Russian literature, particularly Tolstoy, but Raskolnikov reminded me too much of my brother for me to enjoy this wholeheartedly. I too struggled with the book post crime – maybe it was the English translation. But it had more depth to it, more intellectual rigour and understanding of human existence than anything else I’ve read since F Scott Fitzgerlad’s “This Side of Paradise”. I’m starting The Brothers Karamazov by Dostoevsky this evening. I’ll let you know how it is and whetehr to recommend it or not, by all accounts it’s fantastic. I’ve wanted to read this for such a long time but for some reason I’m too intimidated to start. Is it readable or a challenge to get into? actually I thought that it was quite easy to get into. It was the middle bit that was, if anything, a bit difficult, but the ending is great too. Try it!